Last updated 19 September 2018 . By Anisah Audu. Brace yourselves, because Chick 'n' Sours has hatched a plan to head north. The aptly named 'Supper Street' is about to get an injection of finger-lickin' fried food and lip-smacking sours as it's third time lucky for the chicken connoisseurs, whose Angel branch will join successful sites in Haggerston and Covent Garden. Taking over the space which was previously home to Costa Coffee, you can expect cosy seating, complete with a Lazy Susan and alfresco dining for those warmer days. 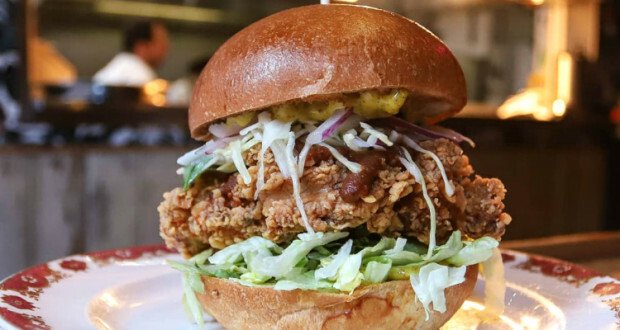 The brainchild of Carl Clarke and David Wolanski, Chick 'n' Sours is famed for its free-range buttermilk fried chicken and you'll find the same delicious offerings on the new menu. Think chicken toast dripping in chilli fish sauce, shin cup fries topped with lashings of Korean noodle crack and burgers like the glazed Seoul Destroyer. Come the weekend, it's all about PBJ French toast, kimchi cornbread waffles and, of course, chicken. Not forgetting the staple sour cocktails, we'll be looking out for the Chick 'n' Club #2; a punchy mix of gin, vermouth, blackberry, apple and vinegar.